Coming up with the money needed for a down payment on a house is not easy for many people. 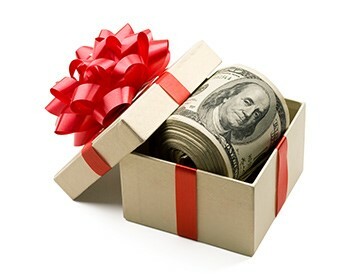 Some are lucky enough to have someone (or several people) give them cash as a gift to go towards purchasing a home. No doubt, that is a wonderful thing! But there are guidelines that must be followed in order to use financial gifts for your down payment. Using gifted funds to buy a home is not as simple as it sounds. First, the money can’t come from just anyone. Lenders want the money to come from a family member, such as a parent, grandparent or sibling. You can also receive gifts from your spouse, domestic partner or significant other if you’re engaged to be married. You may or may not be able to use gifted money for your entire down payment. It depends on the type of loan you are seeking. If you are taking out a conventional loan, all your down payment can come from a gift, as long as you are putting down 20 percent or more. If you are putting down less than 20 percent, you will have to include some money of your own. With FHA and VA loans, the entire amount can be gifted unless your credit score is less than 620, in which case you will have to come up with 3.5 percent of the down payment yourself. No matter what type of loan you apply for, you can only use gifted funds to purchase a primary residence or a second home. In addition to there being restrictions about who can give you money, you will also have to prove that the money is a gift. You will need to provide a gift letter that includes the name of the donor, their relationship to you, the date and amount of the gift and a statement that says the money is given with no expectation of repayment. Both you and the donor must sign the letter. While it’s not necessary, it is a good idea to have the gift in your bank account prior to applying for a loan. That way when your lender looks through your bank statements for the previous few months, they will already see documentation of the gift. If someone has given you money to go toward a down payment, Mike Manosky can help you find your dream house. Give him a call today at 256-508-0211!